Season’s greetings from Lancaster. I am deeply honored to have been chosen to lead the Alumni Greek Council (AGC) for the next two years. As the largest affinity group in the Franklin & Marshall Alumni Association, the AGC represents the more than 10,000 alumni who were members of a fraternity or sorority during their time at the College. 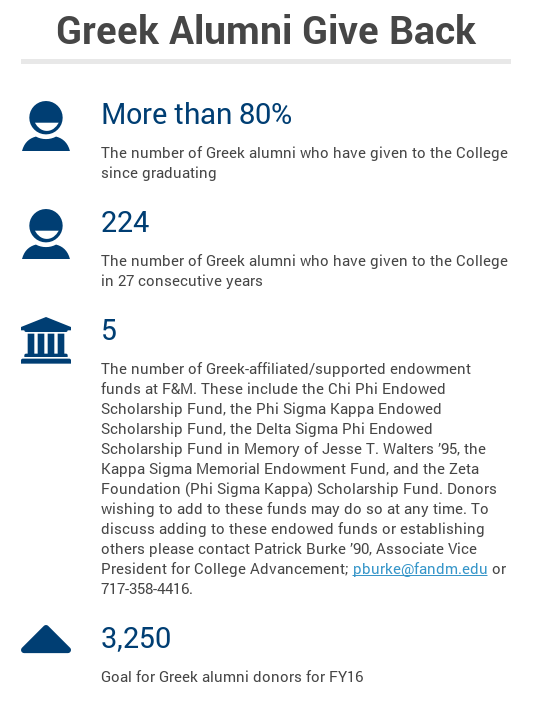 F&M boasts one of the oldest Greek communities in the nation, dating back to 1854. It is my pleasure to introduce the first edition of the Alumni Greek Council newsletter. In creating this newsletter, we hope to celebrate the many accomplishments of our Greek-affiliated students, sustain camaraderie among our thousands of Greek alumni, and share current information regarding fraternity and sorority life. Expect subsequent editions of the newsletter to arrive in your inbox near the close of each semester. I have been actively involved in the alumni leadership of Chi Phi for 20 years. It has been a labor of love, as I look at my fraternity as the most important facet of my life outside of my family and my career. I have always espoused that my life has been greatly enriched by my membership in Chi Phi. My closest friends, many of my most memorable experiences, and my greatest sources of support outside of family have all come from my involvement in Chi Phi. I know many of you feel the same way about your organization. It turns out that those of us who uphold our Greek experiences as the source of many of the most important opportunities in our lives are in good company. A recent survey by the Gallup Organization on the lifelong impact of fraternities and sororities found that across the board, Greek-affiliated graduates of colleges around the country rank virtually every aspect of their lives higher than their non-affiliated peers. Former fraternity and sorority members identified as being healthier, happier, more financially stable, and more socially connected than those college graduates who did not join a Greek organization. In short, there is empirical evidence that people lead better lives as a result of joining a Greek organization (See for yourself here.). This information can inform our efforts to meet President Porterfield’s challenge of creating a model Greek system. We aspire for F&M’s fraternities and sororities to set the standard for all institutions of higher education across the nation. While we are headed in the right direction, we are still a long way from achieving this goal. Many of our organizations are thriving, but there is still ample room for improvement. We must all work together to continue to uplift Franklin & Marshall’s Greek community so that we may remain worthy of national distinction. I truly hope that you enjoy this first edition of the AGC newsletter and that you find this issue informative and perhaps enlightening. I look forward to seeing you back on campus enjoying the company of your brothers and sisters. Be proud of your involvement in your fraternity or sorority and value the connection of your chapter to Franklin & Marshall College. And if you have the time to volunteer and give back, please consider taking on an alumni leadership role in your chapter and the College. To discuss representing your chapter on the AGC, please contact Donna Pflum at donna.pflum@fandm.edu or 717-358-4266. P.S. This newsletter is a work in progress. Please pass on your suggestions or ideas to me at ademarco@lancasterbarnstormers.com or to the alumni leaders of your organization. In addition, I ask all of you to encourage your fellow brothers and sisters to keep their email information active with the College, since our ability to reach the F&M Greek community is only as good as our email database. I look forward to hearing from you! 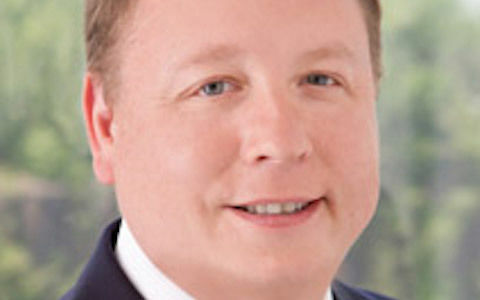 The AGC recently welcomed several new members to its leadership team. 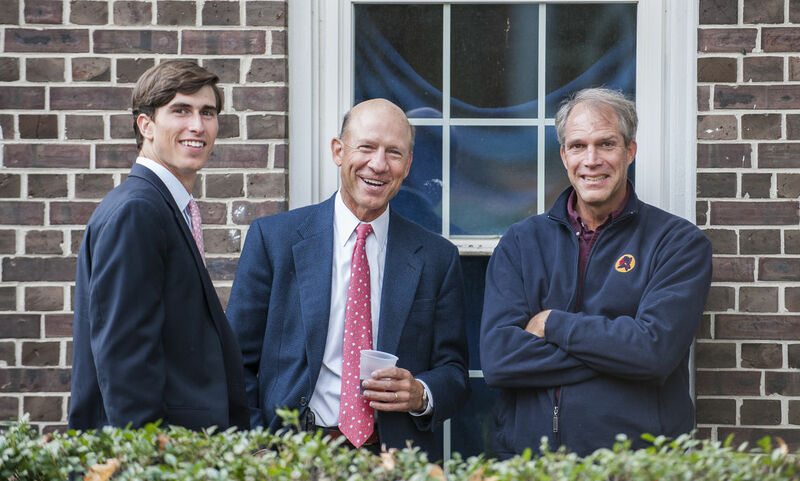 They follow in the exceptional footsteps of former AGC president Dave Costa ’88. 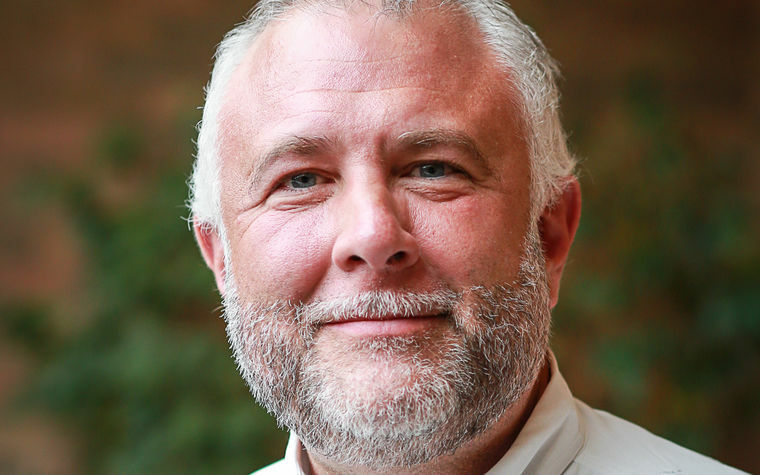 A brother of Phi Kappa Tau, Costa is now senior director at Broadridge Financial Solutions Inc. 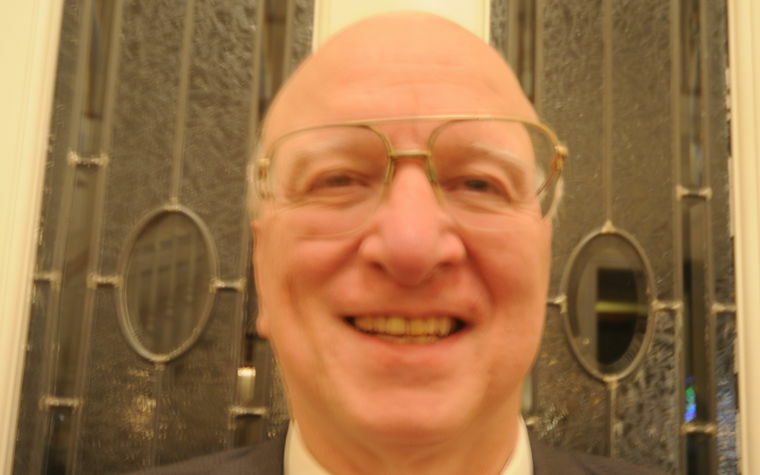 He resides in Hoboken, N.J., and continues to be actively involved in the AGC, Regional Alumni Council, and Reunion volunteering. 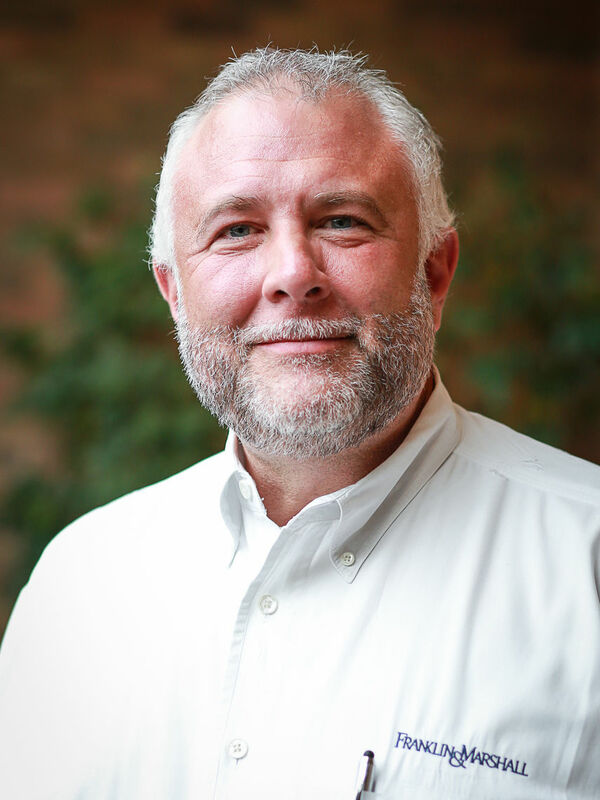 Dave’s leadership and commitment of time are deeply appreciated by the incoming AGC leadership team. 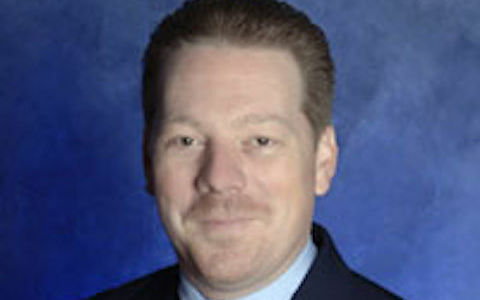 Occupation: Partner, Criminal Lawyer and Commercial Litigator, Kaufman, Semeraro & Leibman, LLP. Occupation: Senior Director at Broadridge Financial Solutions Inc.
Across the country, institutions of higher education are experiencing substantial growth in Greek involvement on campus. This trend is certainly playing out at F&M. Women’s membership has steadily increased over the past few years; the College added a fifth sorority in fall 2014, Alpha Xi Delta, and a sixth is pending for spring 2017. Meanwhile, men’s membership has remained steady for the past several years. Overall, Franklin & Marshall’s Greek community is similar in size to those at peer institutions. Here’s a snapshot of where we stand. We are grateful for the ongoing generosity of our Greek-affiliated alumni donors. Donations to the College via the Franklin & Marshall Fund make possible every facet of the F&M experience—supporting close student-faculty collaboration, energizing campus life, extending financial aid to talented students, expanding programs for student-athletes, promoting ongoing opportunities for learning and discovery, and preparing students for life after college. The collective investment of our alumni community lights a path for generations of students. If you have not done so already, we invite you to make a gift in support of Franklin & Marshall’s students. We remain ever grateful for your support. The fraternities and sororities at F&M are moving in the right direction! It has been a busy and productive year. Last spring, in a new initiative, the Interfraternity Council kicked off their recruitment process with initial meetings on campus in places familiar and accessible to first year students. In September, the Panhellenic Council spearheaded a hazing prevention week filled with activities and programs that engaged the campus community in a critically important dialogue. Currently, the chapters are gearing up for recruitment of new members. I am excited and encouraged by all of the positive energy and efforts to sustain the momentum toward excellence in fraternity and sorority life at F&M! 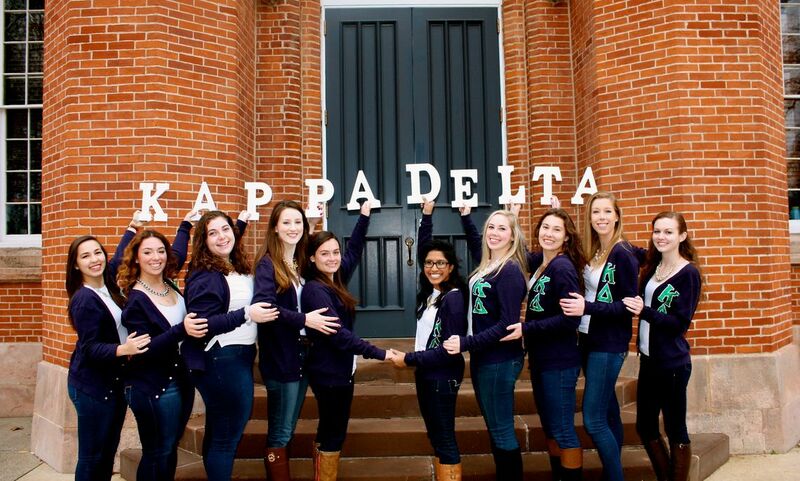 At Kappa Delta, it’s all for a good cause. Virtually everything the 80-member sorority does is informed by a philanthropic bent—from raising money for Prevent Child Abuse America and the Lehman Center in York, Pa., to mentoring Girl Scouts, and from leading a national letter-writing campaign celebrating inspiring women to handing out pencils with motivational messages attached to them during finals week. The latter initiative is inspired by the sorority’s Confidence Coalition, which works to “increase confidence in everyone on campus, especially women,” says newly elected President Shaina Reji ’17. To that end, the coalition plans an initiative every few weeks. “At some point in the semester, every one of our members participates in [these activities],” says Reji. 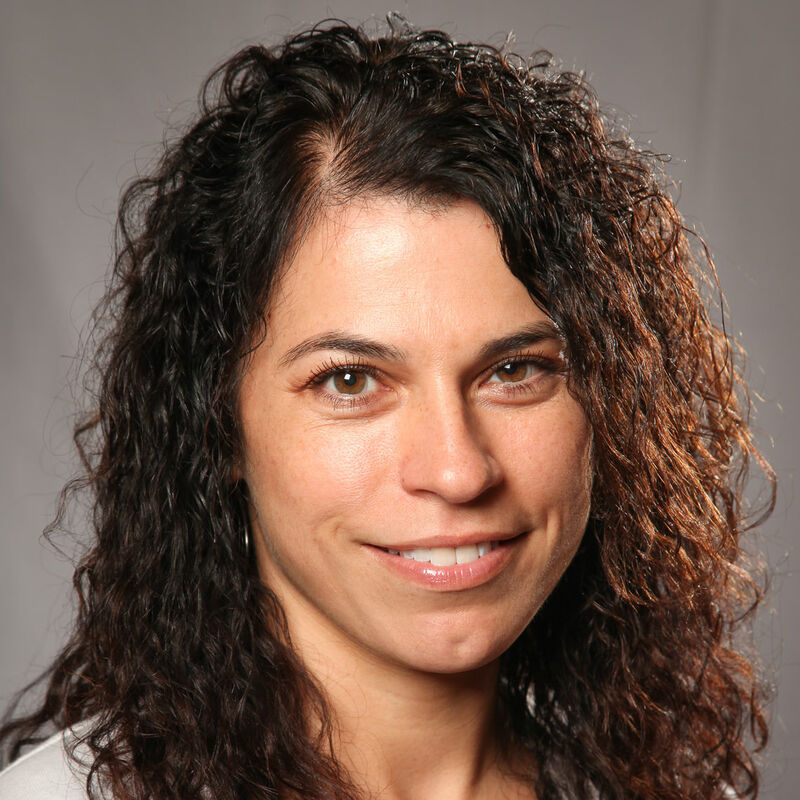 She estimates that 25-30 members bring to life each individual event. Past initiatives have included writing uplifting messages on post-it notes and sticking them around campus, organizing a Zumba event for all sorority members as well as children from the Lancaster community, and leaving balloons around campus that feature messages inspiring people to have confidence in themselves. It’s a cause the entire sorority can—and does—get behind. 1,583: the number of reported community service hours Phi Kappa Psi brothers have completed since Aug. 1. Most recently, the fraternity participated in No-Shave November (“Movember”) in order to raise money for and awareness about men’s cancer prevention. Stats like these are what convinced newly elected President Mark Rooney ’17 to pledge, and they continue to attract new membership to Phi Kappa Psi. But what really sealed the deal for this year’s newest recruits was the fraternity’s recruitment event at F&M’s Millport Conservancy, with which Phi Psi has a friendly relationship thanks to its members’ ongoing volunteer efforts. During Rush Week, the fraternity hosted a large cookout at the conservancy’s event space (The College provided buses to the event.). As these stats show, new recruits will find themselves in good company all year long. Lambda Chi Alpha won the coveted Homecoming Prize on October 28, 1961. 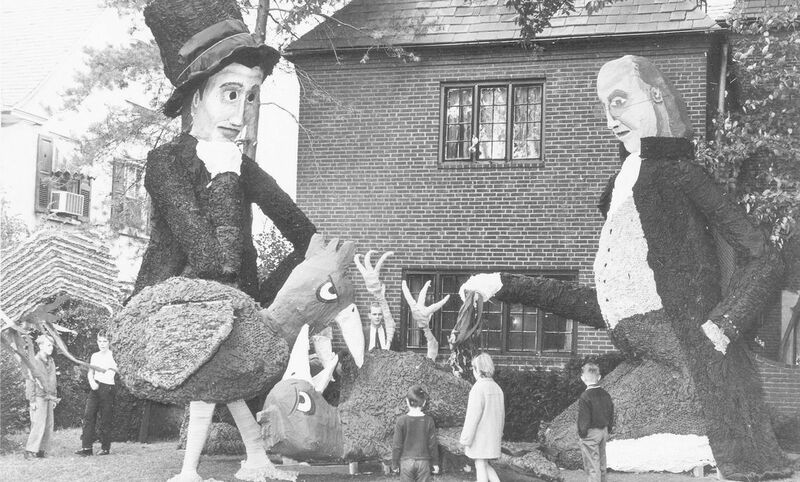 The display, entitled “Diplomacy” presents John Marshall and Benjamin Franklin, each twenty feet tall, observing a fight between two bantams. The bantam was the mascot of Trinity College, which played the Diplomats in football that day. Photograph courtesy of Lancaster Newspapers, Inc.
During the fall semester, Alpha Phi planned 10 community-service events, which ranged from street clean-ups to volunteer work at the local Boys and Girls Club. The sorority also co-sponsored a campus blood drive earlier this year; a record number of sisters donated blood and/or volunteered to assist those making blood donations. Alpha Phi recruited 23 new members this fall. This semester alone, Chi Omega has completed more than 700 community service hours and raised $60,000 for charitable causes. The sorority also recruited 24 new members this semester. From August through November, Chi Phi brothers volunteered their time to coach the Lancaster Tornadoes, a football team comprised of underprivileged sixth- and seventh-graders from Lancaster City. In total, brothers devoted 104 hours of community service to this cause. 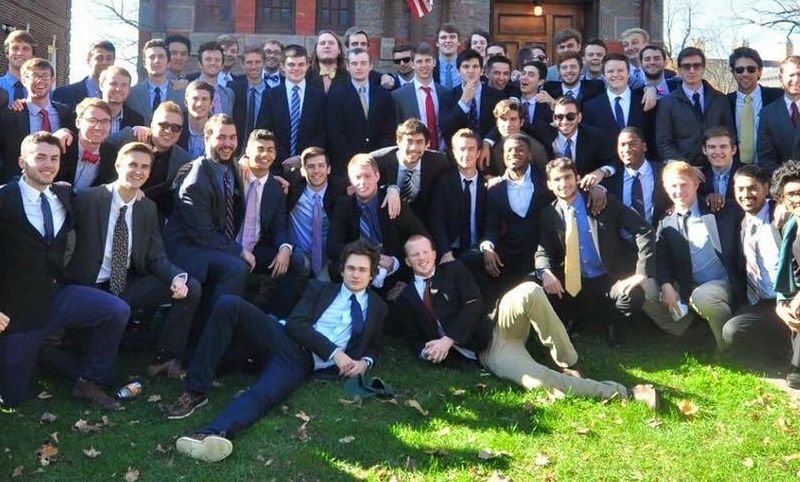 The fraternity also recruited 17 new members this semester. Kappa Sigma has secured a new home at 441 College Ave. The nine-year effort to purchase the property was supported by many generous alumni donors. The fraternity has also completed 400 community-service hours and recruited 10 new members over the course of the fall semester. 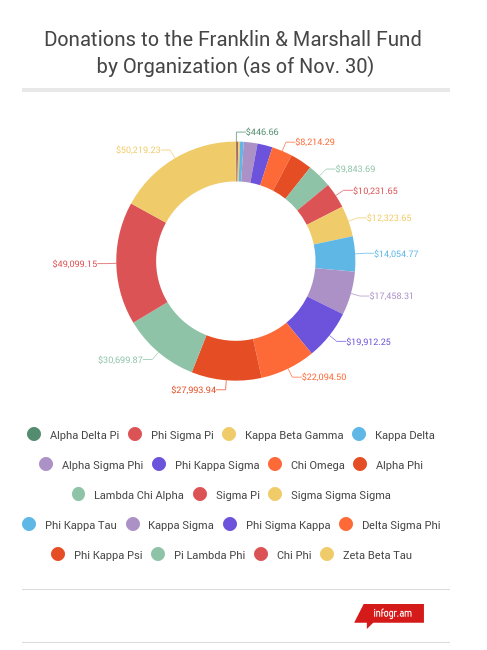 In fall semester, Phi Kappa Sigma has completed more than 125 hours of community service and raised more than $600 to support the fraternity’s national philanthropy, the Leukemia & Lymphoma Society, as well as other philanthropic endeavors. Sigma Pi has logged 143 hours of community service and recruited three new members so far this semester. 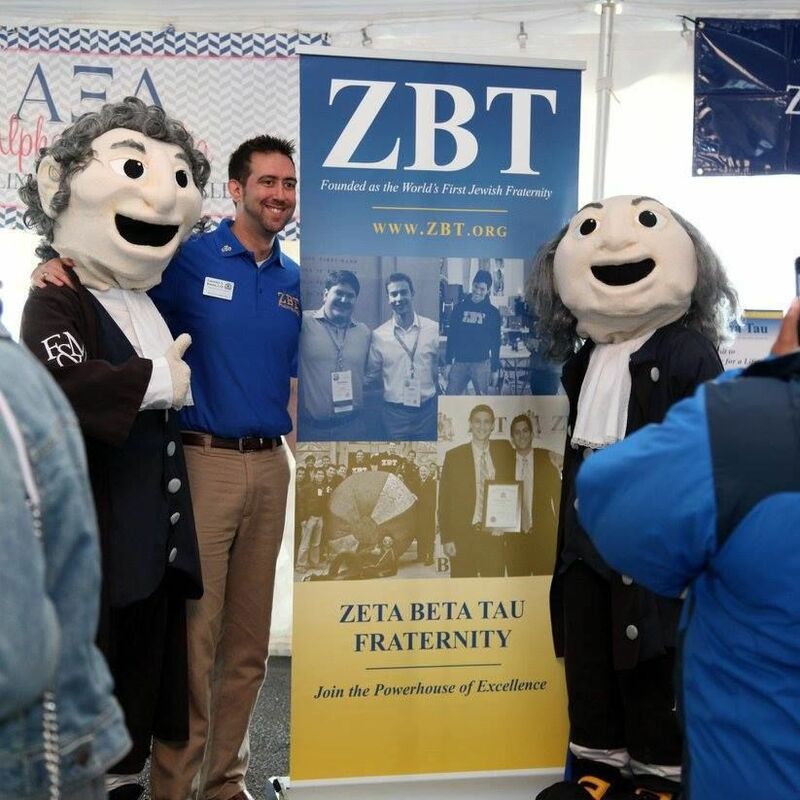 Zeta Beta Tau (ZBT) fraternity is recolonizing its Alpha Tau Chapter during this academic year. The chapter was originally established at F&M in 1931.